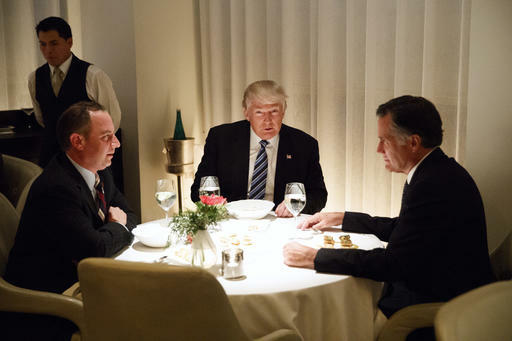 As he continues to form a Cabinet while his advisers feud over who should be secretary of state, Donald Trump dined with a contender for the position -- and campaign trail foe -- former Massachusetts Gov. Mitt Romney. 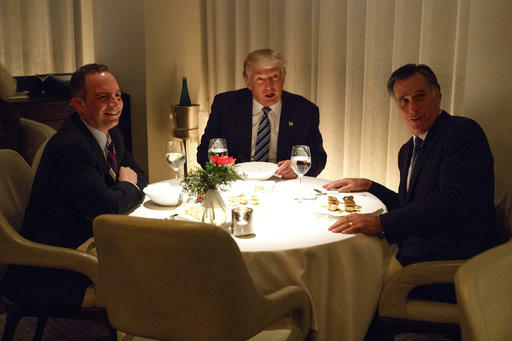 The men, joined by incoming White House Chief of Staff Reince Priebus, met for dinner at Nougatine, a Jean-Georges restaurant located in the Trump International Hotel and Tower off Columbus Circle in midtown Manhattan. 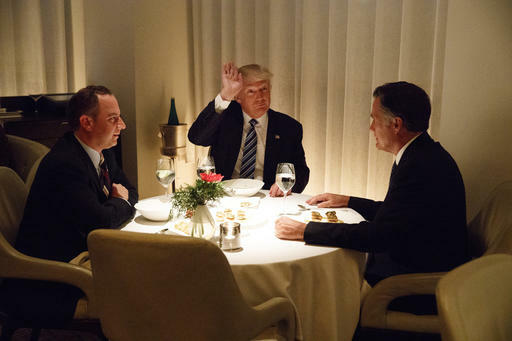 Donald Trump had dinner with Mitt Romney in New York. The exclusive restaurant, which has received three Michelin stars, has a dinner menu featuring a variety of meat, fish and pasta dishes, including Sesame Crusted Salmon, Sautéed Potatoes, Black Olive and Passion Fruit and Crispy Maine Lobster, Buttery Napa Cabbage, Ginger and Scallion. The group dined on garlic soup with thyme and sauteed frog legs as well as diver scallops for appetizers. 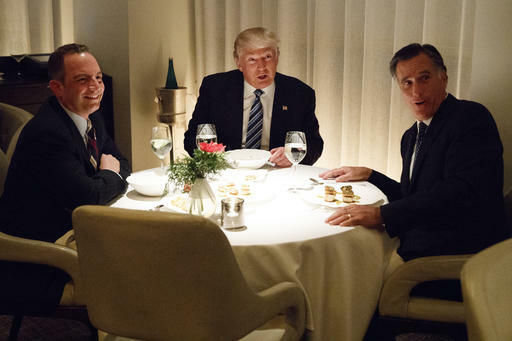 Priebus and Trump had steak and Romney had lamb chops. "I've had a wonderful evening with President-elect Trump," Romney said after the meeting. "We had another discussion about affairs throughout the world and these discussions I have had with him have been enlightening and interesting and engaging. I have enjoyed them very, very much." "He won the general election," he added. "And he continues with a message of inclusion and bringing people together and his vision is something which obviously connected with the American people in a very powerful way." Romney's first audience with Trump was less than two weeks ago in Bedminster, NJ. The former Massachusetts governor and 2012 GOP presidential nominee called the meeting with Trump a "very thorough and in-depth discussion." "We had a far-reaching conversation with regards to the various theaters in the world where there are interests of the United States of real significance," Romney told reporters upon leaving Trump National Golf Club on Nov. 19. According to senior sources, Romney is one of several contenders being considered for secretary of state. But not all of Trump's advisers appear enamored of a Romney pick due to his criticism of Trump during the campaign. Trump's presidential campaign manager, Kellyanne Conway, for example, has publicly expressed concerns about Romney on Twitter and in television interviews. "I think that there was the Never Trump movement and then there was Gov. Romney," Conway said Sunday in an interview on ABC's "This Week." "He went out of his way to hurt Donald Trump." Romney spoke out against Trump in February, arguing that the reason Trump wouldn't release his tax returns at the time was because there was a "bombshell" in them. "I think there's something there," Romney said of Trump's tax returns in an interview with Fox News. "Either he's not anywhere near as wealthy as he says he is, or he hasn't been paying the kind of taxes we would expect him to pay." In an interview with NBC in March, Romney went even further, declaring: "There's no question I'm going to do everything within the normal political bounds to make sure we don't nominate Donald Trump. I think he would be terribly unfit for office." But Romney's strongest rebuke of Trump by far was in an impassioned speech he delivered to the University of Utah that same month. "Donald Trump is a phony, a fraud," Romney said, adding, "If we Republicans choose Donald Trump as our nominee, the prospects for a safe and prosperous future are greatly diminished." Romney also derided one of Trump's biggest campaign trail selling points: "A business genius he is not," he said. "His promises are as worthless as a degree from Trump University," Romney said. "He's playing the American public for suckers: He gets a free ride to the White House and all we get is a lousy hat." But back in 2012 when he was running for president and Trump endorsed him, Romney was singing a different tune. "Being in Donald Trump's magnificent hotel and having his endorsement is a delight. I'm so honored and pleased to have his endorsement," Romney said then at a news conference in Las Vegas. He added that Trump "has shown an extraordinary ability to understand how our economy works to create jobs for the American people." In an interview with The Boston Globe this past March, Romney said he believed he had an obligation to speak out against Trump after months of remaining silent. The final straw for Romney was what he said was Trump's slow move to disavow former Ku Klux Klan leader David Duke. "If Trump had said 4 years ago the things he says today about the KKK, Muslims, Mexicans, disabled, I would NOT have accepted his endorsement," Romney tweeted in March. During the campaign, Trump called the former 2012 Republican nominee a "failed candidate" and a "choke artist." He also dismissed Romney's March speech as "nasty" and "irrelevant," and said the length of the speech was "ridiculous." Romney has never revealed who he voted for in the 2016 general election (he was also critical of Hillary Clinton). However, once it was clear Trump was president-elect, Romney posted on Twitter, "Best wishes for our duly elected president: May his victory speech be his guide and preserving the Republic his aim." Jonathan Karl, Katherine Faulders, John Santucci, Devin Dwyer and Benjamin Siegel contributed to this report.